The Season Six Mega-Meta of the Muller Monthly Music Meta is here, and Pete tells us: The meta for this puzzle is the mega-meta for 2017, a popular song from the ’70s. This meta was not too difficult, since the central down entry spells out just what you need to do: RHYME is the answer, clued as [What you need to find for each of the 12 entries with triple-starred clues in order to get a famous song lyric]. Also note the Muller-esque (meaning: with everything else going on, how did he sneak yet another twist in there?) trio of BOTHER SAND DUN in the seventh column, in yellow above. Those rhyme with “Father and Son,” and earned solvers who noticed them an extra two points for the year. Now, if you actually did the mega-meta throughout the year instead of just this week, then it was not so easy. You didn’t get the RHYME hint and only got one word at a time, so much more difficult. 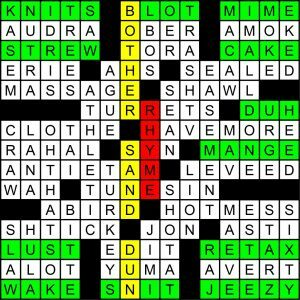 But Pete took it easy on us slackers this year; you didn’t even need to go back to the previous twelve puzzles, since Pete included twelve rhyming words (different from the ones used throughout the year) in this grid. Well, that was another excellent year, wasn’t it? The jewel in the crown was certainly September, which was magnificent, but July and December also stood out. Thanks to our meta maestro for another year of (Born to Be) wild good chases, red herrings, adrenaline rushes, and musical interludes. And here’s some happy news: There will be a 2018 Muller Monthly Music Meta! Pete has more than met his charity fundraising goal , so Season 7, Episode 1 should be in your mailbox on Tuesday, January 2nd (correct me in comments if that date is wrong, Pete). I’m quite pleased that this outstanding and entertaining series will continue, and will be blogging the new season here. After failing to complete a perfect season in 2017 I’ll be highly motivated for a clean sweep in the new year. Happy 2018 to all, and I’ll see youback here very soon. 164 correct answers this month (68 got it before the final puzzle). And I think about half found BOTHER SAND DUN. There will be a 2018 MMMM – thanks to all of you that sent in contributions! First 2018 puzzle will be Jan 9 or 16 and then back to the first Tuesday of every month subsequently. Pete, I would have gladly donated anyway, but it’s great news that there will be another MMMM. Happy new year! We crossed 100 donors and $1500 already (which means there will be a 2018 MMMM) …but it all goes to charity in any case. Thanks! There were a couple of early mega-meta hints: the January puzzle was called “Brother, Can You Spare a Rhyme,” and in the March puzzle Pete echoed that title with the clue for 49D (“Brother, Can You Spare a _____?” The answer, DIME, was the third (***) mega-meta clue. Together those pointed me toward an early mega-meta solve. Great year, Pete! So glad you’re keeping it going!! Once I figured out the rhyming approach, I put lyrics and “It’s not time,” in google, and out popped the answer. So I can understand how some people got this in March. But it took me many more months, finding the red herring, and lots of failed approaches to get there. And I don’t know if I’d have been brave enough to submit without more words that confirmed it. So the early solvers really have my admiration. That was a great year of puzzles. Looking forward to 2018! Just read Pete’s write up. I hadn’t noticed the fathers and sons in the clues all year. Glad he pointed it out. Yet another cool element.